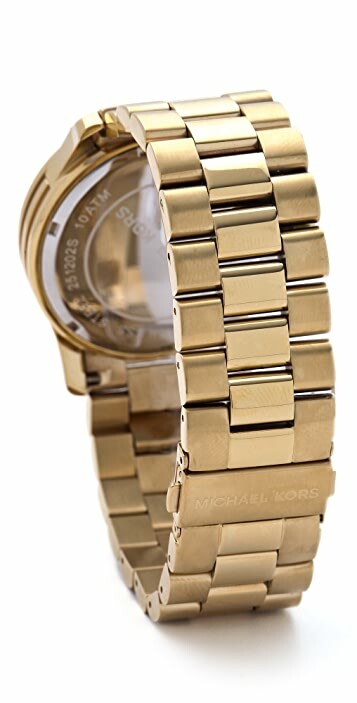 This oversized, water-resistant stainless steel watch features a link band. Chronograph and date wheel at face. Hinged snap closure. 3" diameter. Face is 1.75" wide. Love this watch! Spent a lot of time deciding between this one and the jet set. Already had a large watch so I was use to them. This watch is so beautiful against my dark skin! Perfect! This watch is truly timeless. Love the vibe it gives. Goes with every type of outfit. I know a lot of people are afraid of it being too oversized, it's not! Just go for it, you will not regret it. I love it so much I'm thinking about getting it in Rose Gold. Maybe when another coupon code shows up! (I got this one at 20% off). Thank you Shopbop! A great over sized watch! Even though it says mens over sized watch, both my sister and I bought this watch for ourselves and couldn't be happier. The Gold looks great, a little bit darker than the photo shows but for the better. It is very large so some links may need to be taken out (not really an issue!) It is a real stand out piece. Absolutely love it. Love this watch. Very stylish. Good quality for a reasonable price. This watch is just as described. It's noticeably big but elegant just the same. I'm very happy with it and get postiive comments every day. i expected the watch to be bigger than usual and it did not fail. i'm a plus size female so i want my watch to stand out. however, it was a tad heavy but as it is a men's watch, i shouldn't complain. 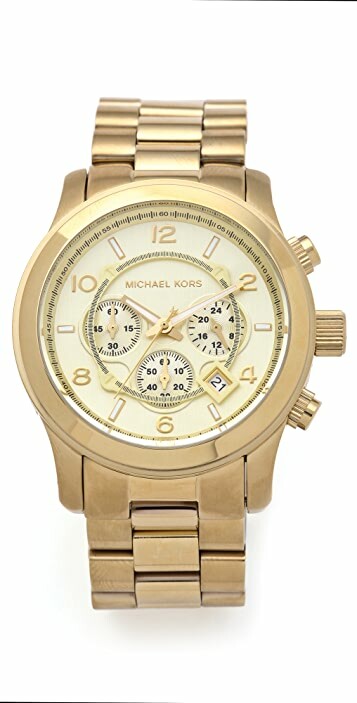 if you go for the gold gold kind of watch this one fits the bill perfectly. Such a beautiful watch, but the face of the watch was definitely too big for my wrist. Didn't look good on me. 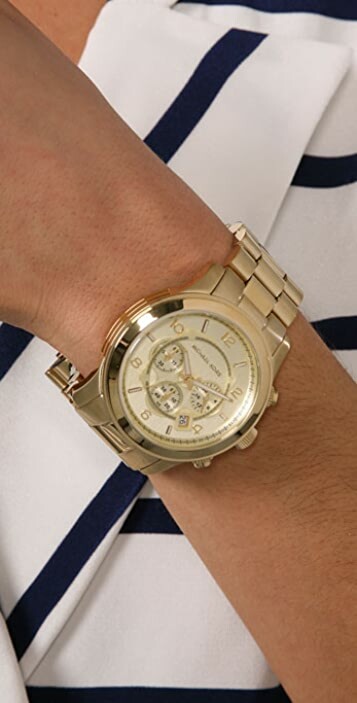 This is the perfect statement gold watch. 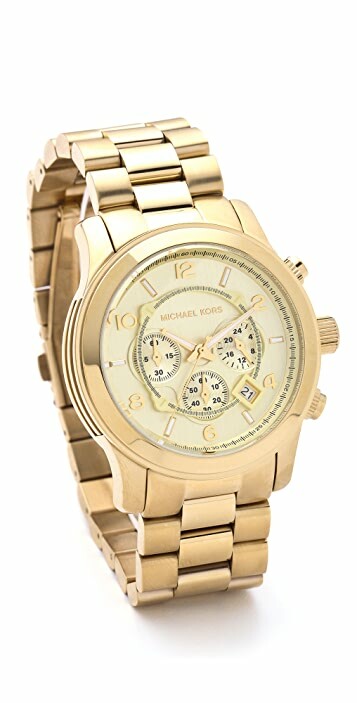 I absolutly love it and the colour gold is soft and not too bright. This oversized style is the perfect accessory and works to compliment any outfit. I am a smaller build and this size is not too big for me at all. Very happy with my purchase! Thank you Shopbop!! This watch goes with everything - its definitely a statement watch due to its size & colour. I get compliments on it all the time. If you don't like big watches, then don't get this watch.